Jeans are pretty cool. They're fashionable - despite being invented many years ago - and hard-wearing. But you know what's really cool? Street Fighter II jeans. 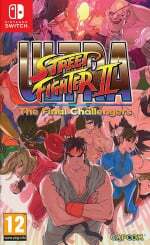 In a move that we're shocked hasn't happened sooner, clothing line Naked & Famous Denim is teaming up with Capcom to create a line of Street Fighter II jeans - the perfect clothing to accompany mammoth session on Ultra Street Fighter II, we'd wager - and a special teaser trailer has been released to get those nostalgic juices flowing. The line will be shown off this Fall. Thanks to Kyle LaFontaine for the tip! What? Hey Jeanius, if you're going to make an ad, at least show your product. Where is the jeans ? yes! finally something to wear with my Guile style wife beaters vest!! Did anyone feel that chill down their spine when the kid picked up a cart with hands covered in cracker oils and cheese dip then blew spit and food into the cartridge. Could it be that was a "New Emperor's (Capcom's) Jeans" ?! You don't blow on SNES cartridges! Video game clothes arouse all women FACT. Oh wow, this is totally RAD!! I just love the current trend of announcing announcements! Don't y'all do too? It's great, right? @NEStalgia I would never wear a crew cut. First annoyance: that's clearly not the SNES playing that character select screen. Second annoyance: wait, they cut before we see Ryu rocking pixelated jeans? Third annoyance: Hang on, so we don't actually get to see the real life jeans AT ALL? Wth!?! Did Jean Claude Van Damme personally dance in those jeans? Or are the slacks coming later? If that cartridge is a Super NES port of Super Street Fighter II Turbo then it's very impressive indeed as SSFIIT was never ported to Super NES.